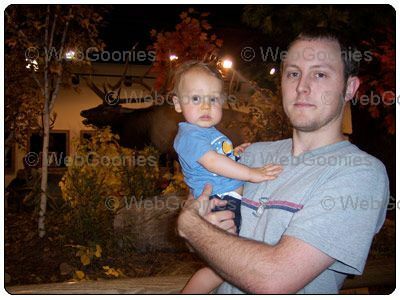 WebGoonies.com - Our trip to Cabelas.. Written on August 21, 2006 by Kevin. There has been alot of talk recently here in Arizona about a huge store opening up. It was to have a large aquarium, built in mountain and a museum. This is Cabelas. For those who don't know (I didn't know until recently), Cabelas is an outfitter store that sells hunting, fishing and other outdoor stuff. There has been so much buzz around this place that we had to go check it out. We have driven by it a few times and noticed its large size but what we really noticed was the crazy amount of traffic. They have a large parking lot but people were having to park across the street and walk a long distance. Police were swarming around the area on patrol and performing traffic control. It was amazing. All this just for a outfitter store? You have got to be kidding me. My wife and I decided to take the walk and check it out inside. We knew what type of store it was and understood that hunting and fishing is not normally our thing. We went for the museum, aquarium and all of the other taxidermy animals. You walk into this place and are overwhelmed by its size. Rylan enjoyed checking out the animals and did quite well for the amazing crowds that were in there. As far as I am concerned, Cabelas is ground zero for redneck activities. I like to think of it as the Disneyland for hunters. I may never understand why there are just so many people wanting to get into this place. I guess it just goes to show that advertisement does in fact work. Overall, I think it will be a nice place to take Rylan to see all of the animals and whatnot. A free place of entertainment is always somewhere to remember. We too also got a Cabelas recently, ours has a neat shooting game on the 2nd floor by the camping stuff and restrooms, does yours have one too? I'm not a big outdoors hunting or fishing person, but having a neat place indoors to stop by for the kids to be entertained by looking at fish, dead stuffed animals, a bit of educational info, and a play area shooting range (which is fun for the kid in us all) is nice. Not to mention I can get my red neck family members gift certificates for Christmas, so they'll have to come down and visit to use the cards. We did have the shooting game up stairs. I had fun with that. :D I got jipped at Disneyland a while back when my gun wasn't aimed right so this was a payback for me.